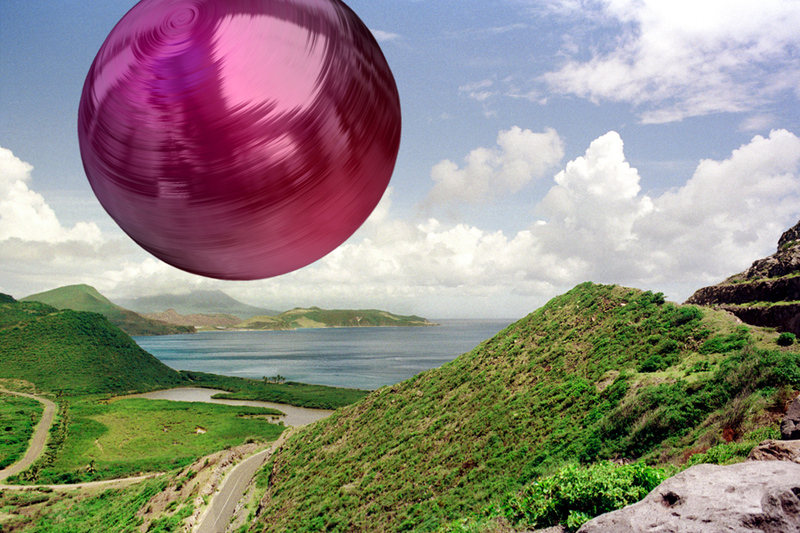 In her recent series titled Frax 4-D, Holly Armishaw bridges the distance between a ‘normative’ photography, exemplified by the generic horizontal landscape-format photograph, which is the familiar fundament of pictorial space, and a completely synthesized digital image, a mathematically-generated ‘morphed’ sphere no recognizable as an particular form. In her attempt to represent the‘unseeable’, a hypothetical, ‘supernatural’ reality, her work reveals the fragility of photographic abstraction and introduces into it a new kind of abstraction. In the Frax 4-D series the abstract configuration of the ‘morphed’ spheres seem to hover over the photographic field unconnected to any element in the ground image itself. Suspended as an autonomous gleaming spheroid within the frame of the picture, they seem to have a life of their own, to exist in contradiction to, and other than, the domain of the pictorial. These gleaming surfaces of their planetary shapes suggest metaphorical associations with ‘another world’, their dynamic twists and turns drawn inward as though by an independent gravitational force. They are in fact of another technical category than the photographic space that they invade, for they are produced by a completely synthetic ‘lensless” and ‘filmless’ process,one that is mathematical rather than visual. By virtue of their crystalline, jewel-like strangeness, these ‘morphs’usurp the primacy of photographic space and occupy the crux of the image. Although the photographic scenes against which they float consist of landscape images that are as exotic and familiar as postcards, they function only as a backdrop. The horizon, although ever-present, becomes irrelevant. The inbred assumptions of pictorial logic have been relegated to the archaic. Holly Armishaw’s work opens up questions about the synthetic nature of reality, about the potential of artifice as a fundament of life. In these works, the ‘natural’ world is represented as something compromised by the reconfigurations of technique. Science, or rather ‘meta-science’ in her works uggests something much more potent than the givens of the natural plenum. The control mechanism of the representation machine, which for the past 150 years has been dominated by the regime of the photographic and which has been given much immense power to verify the real as the truth, here becomes disconnected from the ‘empirical’ real. The Frax 4-D series continues this abstracting process. It proposes a reality that is configured not just by means of the digitalized manipulation of tangible phenomena, but one generated from exclusively and autonomously synthetic processes. This is a visionary process, a willful attempt to imagine a realm that could harbor an ‘out-of-body experience’, where consciousness does not erupt from the mutability of the body in real space but instead accesses the imaginary through pure technique and through the exercise of the will. The technique is the corpusculated distillation of numeric elements, pixels congealed into sublime and autonomous planets that refute the confused phenomena of the everyday world in which we live. Technology becomes the redeemer, offering the promise of science to bring under control the unpredictable and the contingent and to open up new avenues of escape and transcendence. The horizon of fragile realities, the landscape of the everyday, drifts further into the background, leaving the disembodied eye (what is it to ‘look’, to travel through the eye into the ‘other’ world of pictorial space, if not to free oneself from the immediacy of the body?) to hover in a protective prosthetic distance, a pure and uncontaminated space,that recalls the radial abstraction of Kasmir Malevich’s ‘Suprematist’ dream,and which was a cipher for a visionary modernity in that earlier twentieth century.